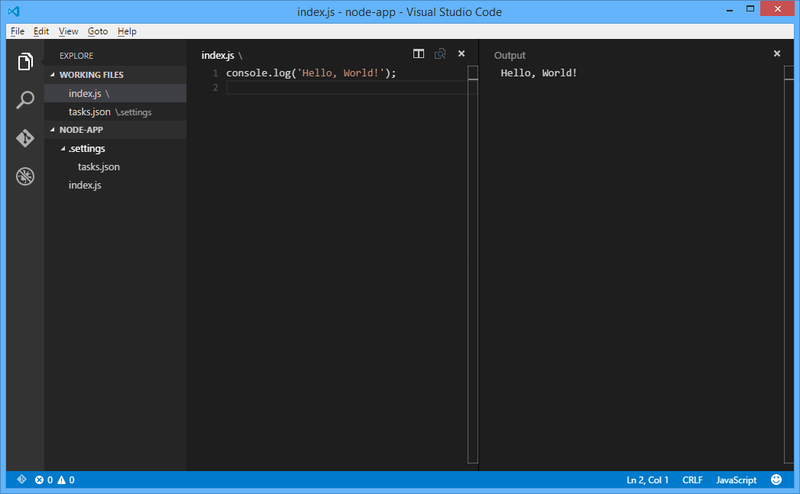 I love the new Visual Studio Code editor/IDE. It's fast, simple, lightweight, and an overall pleasure to work with. I love being able to just "open a folder" and work with files directly – all while getting great intellisense. So I don't need debugging. I want to execute Node against whatever file I have opened at the moment. It turns out this was not built-in – but the good news is that it was not difficult to add the functionality. Yes, of course, I can just go over to a console window and type: "node index.js" as I've always traditionally done. But this makes it even easier/faster and let's me stay within my IDE. Plus, this will always work against whatever file I happen to have opened at the time. One bizarre thing I've found is that I don't (yet) see any way to add multiple tasks to the "tasks.json" file - there does seem to be a way to add multiple tasks for a single command, but not multiple tasks for different commands. Hopefully, this will be a feature that is addressed in new versions of VS Code.